On July 25, at the Government House of the republic, Tatarstan Prime Minister Aleksey Pesoshin together with the Regional Minister of Sport Vladimir Leonov had a meeting with President of the Russian Olympic Committee (ROC) Stanislav Pozdnyakov, who arrived on a working visit in Kazan and took part in the opening of the Beach Handball World Championship, held from July, 24 to July, 29 in Kazan. 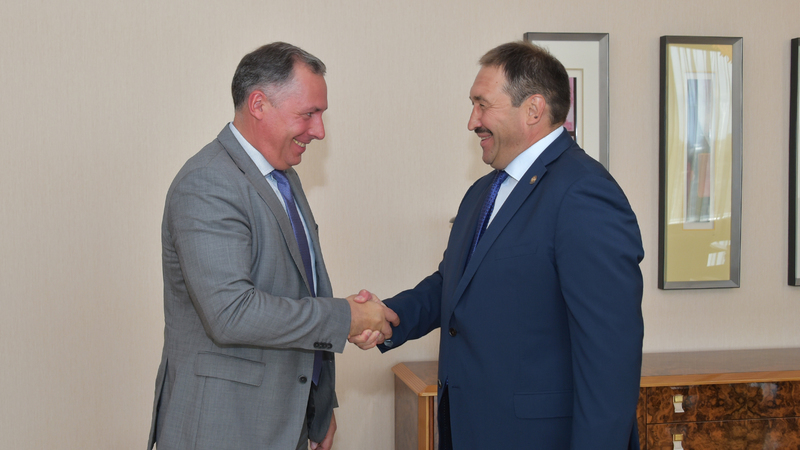 Welcoming the Head of the ROC, Pesoshin thanked him for the attention to the region and for his participation in the opening of the eighth Beach Handball World Championship among men's and women's teams. Since 2014, Kazan annually hosts a festival of beach sports, the programme of which includes a handball tournament. Pesoshin emphasized that Tatarstan has proved to be a region capable of hosting major international and All-Russian sports events. The parties discussed the possibility of submitting an application for the right to host next international sports events in Kazan.